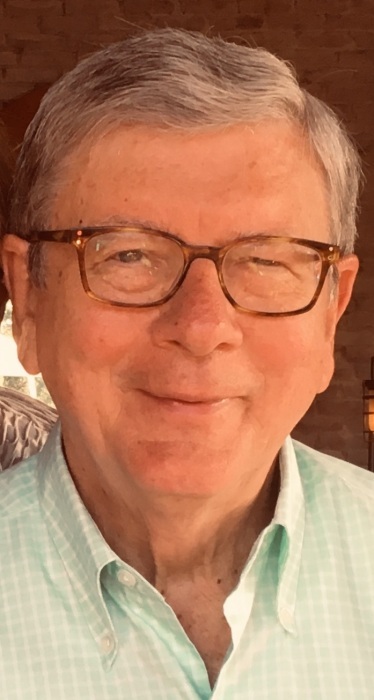 David E. Cook died on February 10, 2019. He is preceded in death by his parents, Paul Myers and Gladis Henney Cook, brothers George and Thomas Cook, sisters Marianne Freeman, Helen Langmeyer, Martha Linden, and Sara Cook and most recently his beloved wife of 34 years, Hallie M. Cook. He is survived by his children: E. Cameron Cook of Hickory, NC, Sarah L. Cook (Kevin Byers) of Atlanta, GA, and P. Brian Cook (Dawn) of Shaker Heights, OH; step-daughters Melissa Curran (Michael) and Jamie Cole (David); and grandchildren Katelyn, Cameron (CJ), and Hannah Cook, Sam and David Byers, and Cooper and Sophia Cook, Rebecca, Katherine, and Sarah Curran, and Lauren and Elizabeth Cole, and many nieces and nephews. Born on January 24, 1938, he lived an improbable life. He suffered the loss of his parents early in childhood and grew up in the Allen County Children’s home. David became an Eagle Scout while attending Northside High School in Ft. Wayne. Because of one man’s intervention, he was able to attend Saint Joseph’s College in Rensselaer, Indiana, on an academic scholarship, and overcame a life of poverty. His career flourished. He retired from Coopers & Lybrand after more than 30 years as the partner in charge of the tax office. The next day he opened his private practice, David E. Cook & Associates, in Chagrin Falls, OH. He served his clients until November 1, 2018. Throughout his career, David gained great satisfaction mentoring many young professionals, inside and out of the tax and accounting world, who today enjoy successful careers. His children will strive to continue his legacy. Outside of the workplace, David shared his time, talent, and treasure widely with many organizations in the Cleveland area and nationally, serving on boards including the Board of Saint Joseph’s College of Rensselaer, Indiana, the Great Lakes Chapter of the Boy Scouts of America, The Cleveland Sight Center, Orange Public Library, and the Children’s Eye Foundation. He spent many years on the board of the Cleveland Ballet and missed it terribly when the company moved to San José. With his wife and friends, he was a long-time patron of the Cleveland Orchestra. An avid tennis player, he played weekly until his diagnosis of stage IV lung cancer. As he entered a period of unimaginable remission, the love of his life was diagnosed with the same disease. They cared for one another privately until Hallie’s death on December 11, 2018. At the same time, David learned that his cancer had progressed. Because his goal was to live to 82, he endured radiation treatments. In late January he lost his edge over the odds. The cancer he fought for two and a half years cast a shadow on his vibrant life. His children were at his bedside and spent his final moments with him. Those who wish to honor David’s dedication to mentoring and belief in the power of one person to make an impact on another may make contributions in his name to the David E. Cook and Father Charles Robbins Scholarship, attn Telly McGaha, Honors College, Georgia State University, PO Box 3999, Atlanta, GA 30302 or Community of Hope, 4019 Prospect Ave E., Cleveland, OH 44103 www.hopecle.org. Private family service and interment in South Whitley, Indiana. The family will receive visitors on Saturday, February 16 from 5 p.m. to 8:30 p.m. at 2255 Botanica Lane, Pepper Pike, OH. The family asks visitors to be prepared to celebrate a remarkable life.